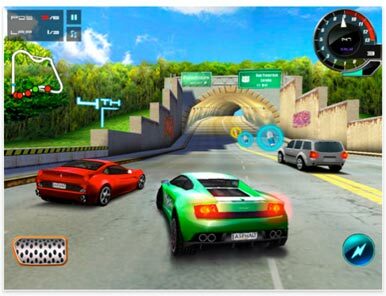 On Friday, mobile game developer Gameloft announced the launch of eight games for Apple’s iPad available now on the App Store. The new games are N.O.V.A. Near Orbit Vanguard Alliance HD, Modern Combat: Sandstorm HD, Dungeon Hunter HD, Asphalt 5 HD, UNO HD, NFL 2010 HD, Let’s Golf! HD, and Real Soccer 2010 HD. Each game’s textures and models have been optimized for the iPad’s larger, high resolution screen, which also allows for a more immersive experience, more complex map layouts and, in the case of Real Soccer 2010 HD, a better view of the entire playing field, complete with high-definition grass. Games like N.O.V.A. have more multi-touch controls, like rotating three fingers to open an airlock door and moving elevators by sliding a button. N.O.V.A. also supports Multiple Target Acquisition (MTA). With UNO HD, four users can play on a single iPad using the new One Device Multiplayer mode, or they can challenge friends on iPad or iPhone devices locally or online with Wi-Fi multiplayer gameplay.